You are here: Home » Forums » Probiotics » [UK] New raw vinegars, not just cider now! [UK] New raw vinegars, not just cider now! Rayners have recently introduced a line of organic, raw, unfiltered, unpasteurised vinegars ‘with the mother’. They claim their raw, unfiltered red wine and white wine vinegars are a first in the UK. Also in the range are raw coconut, pomegranate and apple cider vinegars, all ‘with the mother’. The new line looks to be stocked by quite a few online health food stores. Thought I would post my initial impressions of the two Rayners raw vinegars ‘with the mother’ that I purchased. So far I have used the red wine vinegar twice in ‘Middle Eastern tomato salad’, and the apple cider vinegar twice in ‘Raw mushroom and onion salad’ (both posted in the Recipes section). The	Rayners apple cider vinegar is less sour/ slightly sweeter than my previous brand (Biona Organic). In this particular recipe, the Rayners red wine vinegar does not taste any different to my previous product (Sainsburys own brand). Both bottles have plenty of ‘live’ sediment so need to be shaken well before using. I am likely to repurchase, whether for myself or as a gift (pretty bottles!). Does anyone know whether there is a recommended dose? I am pre-diabetic and I’ve started using cider vinegar to counter blood sugar spikes. I’m taking about 20 ml, diluted with 30 ml of water immediately before meals, which I find quite palatable. Is there any evidence for any other dosage regime? Thank you for this. So far I’ve been buying ‘raw’ cider vinegar from supermarkets but I’ll keep an eye out for the wine vinegar. 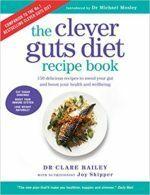 Ian Spencer: Participants of the trial mentioned in the Clever Guts Diet book (p.144-146) took two tablespoons, so a 30ml ‘dose’ of apple cider vinegar. I don’t have Dr Mosley’s Blood Sugar Diet book, but that may well have more information. Do you have a blood glucose monitor? Testing yourself regularly would be a great addition to your detailed food and symptom diary (p.187-188). Different protocols (dose/ timing) may fit with different meals, physical activity levels, prescribed medication or BMI/ bodyfat. If you are on any medication it is important to check any supplements with a health professional (pharmacist/ family doctor/ dietician).